The EM-Tec graphene TEM support films are extremely thin graphene sheets supported by either lacey carbon or fine mesh copper grids. The EM-Tec graphene supports are available with single, dual, 3-5 and 6-8 layers (sheets) of graphene and cover the 3mm diameter TEM grid. Completely. The usable area of the graphene surface is approximately 75% due to some folds and wrinkles in the graphene film. 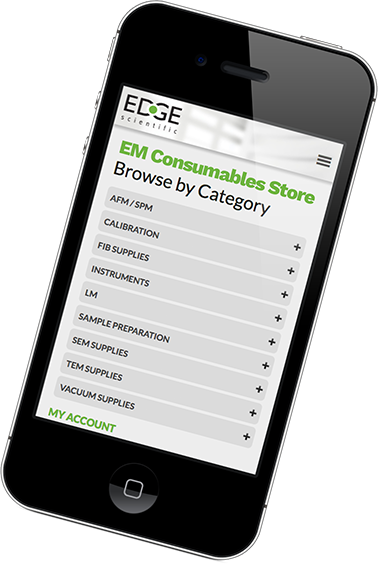 The EM-Tec research ready TEM supports enable getting quicker results in the many fields of research were graphene is used. 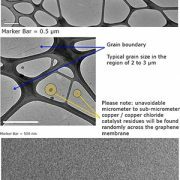 Graphene, with it's unique properties, offers a support TEM support film which is much thinner, yet more conductive than the traditional carbon support films. Even with the hexagonal structure, the contribution to the image formation signal is rather low. These properties make the single and dual layer graphene films ideal for high resolution TEM imaging, nanoparticles imaging and imaging of weak contrast specimens. The 3-5 and 6-8 layers graphene TEM support films are more robust and are research-ready platforms. They can be used straight out of the box. They enable conducting experiments directly with or on the graphene film with integrated or subsequent TEM imaging. The graphene used for the EM-Tec graphene TEM support films is grown on copper foil using the CVD process. The graphene is isolated by etching away the copper foil and is then transferred on the lacey carbon or the 2000 mesh grids. The result is a graphene support film with a graphene film consisting of either a single, dual, 3-5 or 6-8 layers of graphene. As a result of the manufacturing and handling processes, some unavoidable sub-micron copper or copper-chloride particles can be found across the graphene films. The sheet resistance for a single layer of graphene is 600 Ohm/sq. The in-plane modulus of the graphene used is 0.9 TPa (compared to 1.0 Tpa for graphene produced by the scotch tape method). - High quality, clean lacey carbon which is supported by 300 square mesh copper grids. The result is graphene layer(s) on top of lacey carbon on top of 300 mesh copper grids. The usable area is about 2mm in diameter with a transmission of 49%. The openings in the lacey carbon are randomly distributed, with the majority varying from 15 to 1µm leaving unsupported graphene over the lacey openings. - 2000 mesh fine aperture copper grids supported by 2x1mm slotted copper grids. This combination delivers a rigid support, yet the total thickness is less than 50µm. The usable area is a slot of 2x1mm with a transmission of 41%. The openings in the 2000 mesh copper grid are circular with a diameter of 6.5µm leaving unsupported graphene over these circular openings.